RunKeeper is already one of the best ways to track your more vigorous cardiovascular activity, but for those who merely want to count their steps the company has launched Breeze, a delightful and simple app that plugs into the data gathered from the iPhone 5s’ M7 chip. 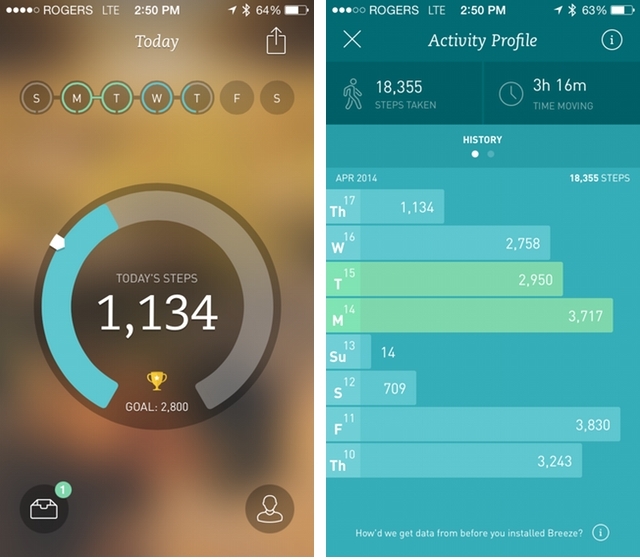 Like the HTC One M8 and Samsung Galaxy S5, the iPhone 5s has a chip dedicated to collecting and making available activity data for apps such as Breeze. Without collecting location data, the M7 offers developers the last seven days of activity. Of course, once you open the app and begin using it, Breeze accumulates as many days as you would like it to. While it’s not a replacement for the dedicated RunKeeper app, Breeze quickly allows iPhone 5s users to track and compare light activity levels — those times that aren’t explicitly dedicated to running, walking, cycling or other forms of exercise — over time.